The devil is in the detail in this well-crafted, contemporary addition to an existing heritage home perched high on a hill in Sydney's Eastern Suburbs. Queen Bee was designed by CplusC and built by a true craftsman, evidenced in the quality of finishes and painstaking attention to detail throughout the project. The design aims to contrast the existing heritage home with a contemporary addition to the rear. Rather than trying to match or replicate what was already there, Queen Bee takes design and material cues from the existing fabric of the home. The new living areas of the home are orientated towards the rear to maximise sunset views over Randwick and Centennial Park with the pool extending out from an entertaining deck. 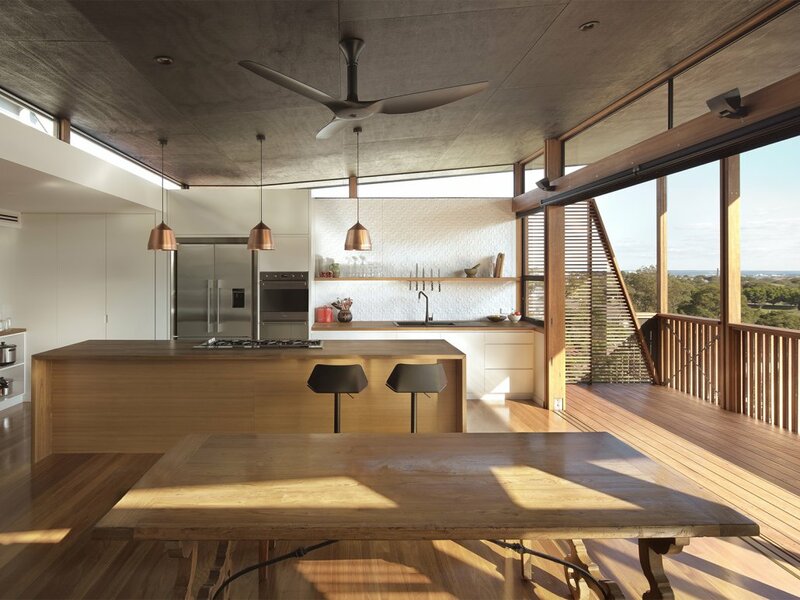 The butterfly roof allows light and warmth to enter the kitchen and living room throughout all hours of the day, while the western facade is shaded externally to prevent heat loading the building in summer. An expressed timber structure and natural finishes contrast with the masonry, painted surfaces and decorative detailing of the existing house.